» REI Kingdom 6 Review (February 2019 UPDATE): Is the Kingdom 6 Worth it? REI Kingdom 6 Review (February 2019 UPDATE): Is the Kingdom 6 Worth it? REI might be better known as a retail store than a manufacturer but don’t let you throw that off from their brand name products. 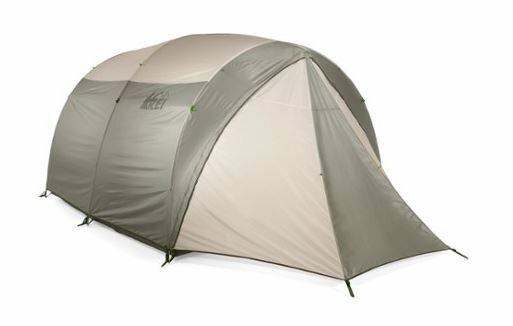 The Kingdom 6 tent is an excellent example of a high-quality, large capacity shelter that easily performs with popular tent brands like Nemo and Big Agnes. For the size, it is extremely budget-friendly, and it has many advantages over any competing six-person tent. In many ways, it has become the go-to, quality tent for family camping. The Kingdom 6 was just redesigned in 2016 with some excellent design improvements, and it continues to perform just as well as the old model. The similarities between the two models are vast and many fans of the first Kingdom 6 are still happily using their tent after many years. The Final Stake: Is This REI Co-Op Tent Worth it? REI Co-op took a lot of time designing their Kingdom tent series. Here is a rundown of all the basics of how this tent is constructed and what you can expect from it. The Kingdom 6 has a lot going for it but it isn’t so feature-rich that it would feel like it’s too much for the camper that enjoys simple shelters. REI really hit the nail on the head with the design of this model, as the numerous positive reviews for it prove. This super airy, open tent is everything you could want for camping trips that call for maximum living space with minimal fuss. It is particularly ideal for parents camping with their children as the tent can be divided in half via an interior door for privacy. With nearly 84 sq ft of area and a tall 6′ 3″ ceiling, this tent isn’t going to leave you feeling claustrophobic at all. The size of this tent also means it is fairly versatile. It would be perfect as a “base camp” campsite tent at an all day festival or picnic, with plenty of space for people to gather inside. Take off the rain fly and you will have a great bug-free hangout spot for summer. There’s even enough room for an air mattress or sleeping cot, should you desire. One of the coolest features about the Kingdom 6 is that the new 2016 redesign added more mesh to the canopy of the tent. This offers two benefits – awesome views and incredible airflow. 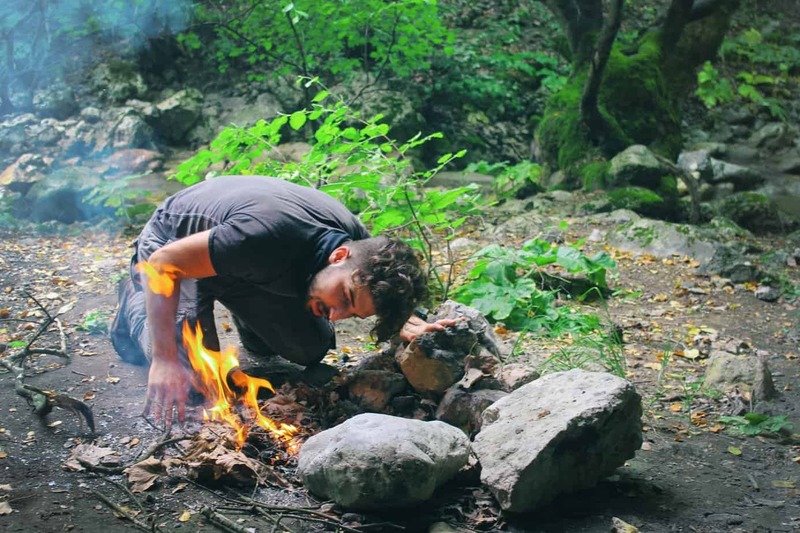 During warm weather camping where there is no fear of bad weather, it makes sense to not use the rainfly in order to keep cool. Camping is fun for a lot of reasons but most people will agree that the experience of being surrounded by darkness and looking up at the sky is amazing. With the Kingdom 6 tent you can get an unobstructed view of the sky at night. If you love the feeling of sleeping under the stars but still want protection from insects and the ability to quickly get under cover if the need arises, this tent is going to really make you happy. The canopy actually makes it a great family camping tent, ideal for younger campers to star gaze (check out the sailor moon) and otherwise enjoy the night sky! Every REI Kingdom tent is compatible with the Kingdom Garage Attachment. Majority of the fans of this tent urge potential customers to invest in this accessory for the Kingdom 6. The Kingdom Garage is a pole-support awning that zips right onto the tent via the Connect Tech zipper. It adds an additional 61 sq ft of storage and living space. Just like the tent, it is completely weatherproof and can be configured in many different ways to suit your purposes. You can purchase REI 6′ poles separately to get the most of being able to use the Garage as an awning. Most people that are interested in the Kingdom 6 want it because of the sheer amount of covered space it offers. It only makes sense to invest in the Garage to maximize your experience with this tent. The footprint for the tent doesn’t cover the garage, but most people choose to use the garage as a kitchen, dining room or dirty gear storage space which makes it work out well. 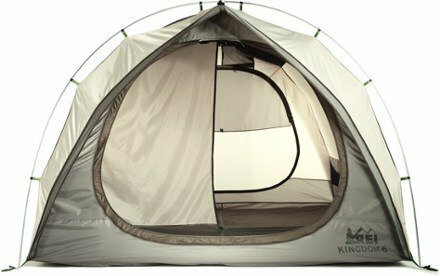 The Kingdom 6 is easily a 5 star tent experience, but no model is completely free of faults. This model’s only fault coincides with its advantage of being so large. There is only one downside to the design of the Kingdom 6, but it’s one that can’t really be helped. Due to the tall height and vertical sides of the tent, it can catch wind easily. While some customers haven’t had issues with their tent in high winds, others have found that sudden bursts can cause the tent to crumple or topple over. Though this tent is freestanding in design, it’s recommended that if you could experience windy conditions that you should tie it out properly. The tent comes with stakes, guylines, and stakes for the guylines but many customers find that using extra stakes to make the tent taut as possible is the best option. How does the REI Kingdom 6 respond to strong winds? It seems that many users have had problems because of their flexible poles. So it does not have a good performance in climates with strong winds. 2. Does this tent need to be folded to fit in its case or can it simply be stuffed? Yes! It is a very big tent but the tent’s case is big enough for the tent to be folded in (with just a little attention to the folding technic). The garage poles fit in the bag’s center divider the bag with the other tent poles, and it has an excellent advantage in terms of weight. It is very light. 3. 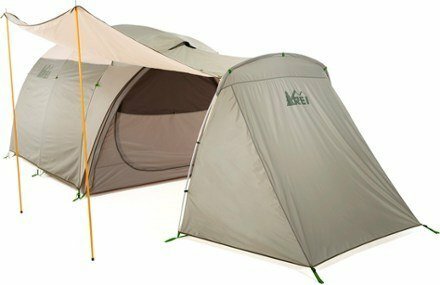 How many people can comfortably sleep in the REI Kingdom 6 tent? The REI Kingdom 6 can easily handle 4, or even 5, average-sized adults, but, 6 average adults can be a challenge. If you are a family of 6, including children, this tent will fit perfect for you. Which is the Better Option for Families / Groups? I get this question a lot, particularly from families but also for couples who are camping together. My short answer is that I strongly prefer going with the six- person tent option. The extra space for gear and “no elbow touching” is a really nice luxury to have on the trail. While the 4 person technically fits 4, you will have to get cozy with your gear (and family / friends). The other added benefit in my book is the sand mat and “front porch” standard on the 6-person version. The only consideration is for campgrounds or conditions where the larger footprint just isn’t practical (or allowed). Note: Learn more about our top recommended 6-person tents. 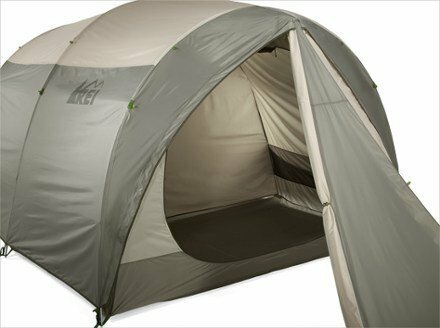 Overall the Kingdom 6 is an excellent example of a roomy, multi-person capacity tent for 3 season use. It is perfect for warm summer nights but can easily handle cold fall temperatures or spring rainstorms. Those that need something roomy for a long-term camping trip will find that this tent can almost function as a complete living area for two by dividing the floor space into a bedroom and living room. The amount of livable space is a clear win for the Kingdom 6. This room divider is perfect as a family tent, separating the grownups from the little ones OR for couples camping. For the price and all the praise it’s garnered, the Kingdom 6 is a must-have for campers needing a bigger tent that won’t break the bank or be too bulky that it won’t compress down into a backpacking stuff sack. For the latest pricing and deals, be sure to check this exclusive listing. Looking for a tent that can handle windy conditions? Consider the Big Agnes Flying Diamond, or any of the tents in our guide of the Right Tents for Windy Weather!